When my employer first bought Kentico training courses, I was not one of those who got access to it. I wondered why. But I said to myself, perhaps he thinks I don't need it. Besides, I'm into Customer Support and I'm quite familiar with Kentico CMS already and I don't need the CMS training. All the more with the Developer's Training because after all, I'm not a developer. Hehe. And Learning Workflows is one of them. I've seen it. I had a discussion with it with a previous developer (back then when he was learning about Kentico) and I got excited to know a bit about it. It's like one of those AHA moment. When you finally know what it is and where it is configured. So for example, you want to create a Workflow where an Editor will review the page's content. You can do this by creating a Basic Workflow. Note: Basic Workflow has default steps already which are Edit, Published and Archived so you'll just need to add the new step. 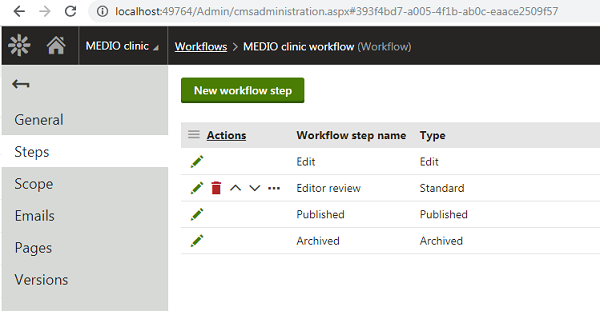 You can apply workflows to individual pages, defined scope of pages or for an entire website. Anyway, if you are interested to learn more about Worfklows also, check-out this link.